What are the system requirements for Batch PDF Merger? Windows: Microsoft Windows 10, 8, Windows 7, Windows Vista, or Windows XP. How do I install Batch PDF Merger? Click Save File when prompted. 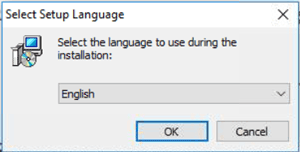 Select your language and follow installation instructions and you'll be all set! double click the Batch PDF Merger file. Follow install instructions to complete the installation. 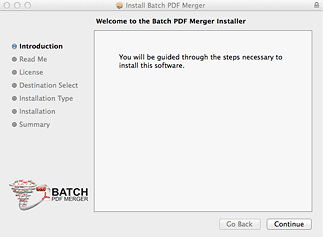 How do I uninstall Batch PDF Merger? Click the Batch PDF Merger entry that is listed. Select the Batch PDF Merger app and click "Uninstall". Simply drag Batch PDF Merger program out of the Applications folder into the trash. Empty the trash. If an error occurs during the merge, this typically means one of your PDF files is encrypted or corrupt. Most of these errors are fixed in version 4.4 or higher. Click here to download the latest version. Windows Users: Open the PDF file with Adobe Reader (here's a link to the free download of Adobe Reader). Simply double click the problematic file and now it will open in Adobe Reader. Then save the file with a new name (File>Save as>PDF), choose a new name and location. Try re-merging the newly saved file. NOTE: This is not the same as right clicking on the file and renaming it!. Mac Users: Open the PDF file in the Preview Application and rename the file, save it, and try re-merging the PDFs. How do I turn off antivirus in order to register the license key? Please follow instructions outlined on this page. How do I get a Batch PDF Merger license key? You may obtain a Batch PDF Merger key now from our web store. You will get your license key in less than 2 minutes! We accept all major Credit Cards, Paypal, bank wire transfers, purchase orders (PO), and checks/money orders (available for US customers only). 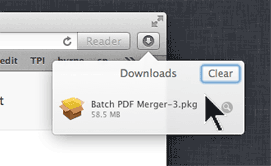 First, make sure you have downloaded the latest version of Batch PDF Merger from the download page. To activate the key and use the program, you need to be connected to the internet. With the 2-year plan, your key can activate up to 3 computers simultaneously. With the annual plan, the license key will activate one computer. The key cannot be used at the same time on multiple computers. Yes, Batch PDF Merger can now be installed in server environments. Please contact us beforehand to generate a quote for the number of seats you require. After I get my license key, do I need to download and install anything? You will be shown your license key immediately after the purchase. We also send an email within seconds confirming the transaction, which includes the license key for your records and license key activation instructions. A license key will remove these restrictions. My computer crashed, how do I recover my license? Please visit our Lost Key Page. Do I need Adobe Acrobat to use Batch PDF Merger? No, you do not need Adobe Acrobat. In fact, you'll save hundreds of dollars by using Batch PDF Merger. 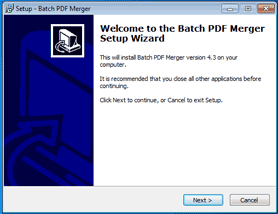 Batch PDF Merger is the #1 file merging alternative to Adobe Acrobat. Let Batch PDF Merger do the heavy lifting for you. Both Mac and Windows versions are available. Why should I use Batch PDF Merger over an online service? Three words: Security, Speed, and Size! With online services, you need to upload all your files to an unknown web server (or "the cloud"), which at times may not have the necessary security features in place to protect your confidential PDF documents. With a desktop application such as Batch PDF Merger, every part of the merging process is done right on your computer. Nothing leaves your computer. There are no file size restrictions or security issues. Since you are not uploading/downloading your documents, the merging process will be much faster than an online PDF merging service. I have a pdf file with many pages. How can I remove some of the pages and merge them back into one document? This is a very common scenario. First, add your files into the program and click the "Split/View Pages" button. Your pages will appear in the right window and from there, you can remove select pages. When you are finished, go ahead and click the "Merge Files" button. If you need to split each page into into its own file, we offer a more advanced product that will handle PDF file splitting - Multi PDF Splitter. I need to combine 6 PDF files, but I need page 3 of file 1 to be inserted between pages 34 and 35 of file 3. Is this possible? Absolutely. After you drag the PDF files into the window, simply click the button "Split/View Pages" and you can then drag and insert individual pages in between other pages of your files. You control the order of the merged file. A page thumbnail is shown to guide you in selecting the proper page. If you need to save the split PDF pages as individual files, you will need Multi PDF Splitter. My PDF files have hyperlinks in them. After I merge these files with Batch PDF Merger, will the links still be active? Yes, Batch PDF Merger will retain all hyperlinks embedded in your files after a merge. After combining my PDFs, the merged file is too large to send as an email. Please help! Oops! This is a very common problem. We recommend using one of these free services: SendSpace.com or Dropbox. Dropbox allows you free storage up to 2GB so you may freely share your large documents. Does your program convert PDF to JPG format? No, but we recently released a new product - Multi PDF Converter, which will convert multiple PDF files to JPG/JPEG or JPG/JPEG back to PDF.